Two way selection (if, if-else, nested if-else, cascaded if-else), switch statement, ternary operator? Go to, Loops (For, while-do, do-while) in C, break and continue, Programming examples and exercises. ARRAYS AND STRINGS: Using an array, Using arrays with Functions, Multi-Dimensional arrays. String: Declaring, Initializing, Printing and reading strings, string manipulation functions, String input and output functions, array of strings, Programming examples and Exercises. Basic of structures, structures and Functions, Array of structures, structure Data types, type definition, Defining, opening and closing of files, Input and output operations, Programming examples and exercises. Pointers and address, pointers and functions (call by reference) arguments, pointers and arrays, address arithmetic, character pointer and functions, pointers to pointer ,Initialization of pointer arrays, Dynamic memory allocations methods, Introduction to Preprocessors, compiler control Directives, Programming examples and exercises. Text 1: 5.1 to 5.6, 5.8. Text 2: 12.2, 12.3, 13.1 to 13.7. Introduction to Data Structures: Primitive and non primitive data types, Abstract data types, Definition and applications of Stacks, Queues, Linked Lists and Trees. • Design and develop modular programming skills. 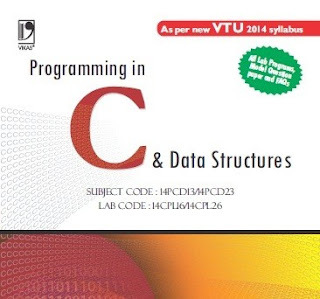 • Understands the basic concepts of pointers and data structures. Language, 2nd Edition, PHI, 2012. 2. R S Bichkar, Programming with C, University Press, 2012. 3. V Rajaraman: Computer Programming in C, PHI, 2013.